It is incredibly difficult for me to put myself in the shoes of an elderly person. Is it awesome? Do you just chill out? Or is it desperately lonely and listless? A little of both? Am I a little bit terrified of the potential scenario? Honestly, yes. Yes I am. The odds are I will be bereft in one way or another: maybe without a driver’s license, maybe without the use of my legs, or maybe even without my spouse. My kids might live thousands of miles away, or our relationship might be strained, and, of course, they’ll be busy with their own lives. There are millions of Americans living these realities in their convalescence. What are the most practical ways of diminishing the negatives and bolstering the positives of aging? One way that gets a lot of press is pet ownership. The hype is that pet ownership reduces stress and loneliness, and increases activity. This is certainly true some of the time. But what about when said pet dies? What about vet bills for those on fixed incomes? What about when an elder must move into an assisted living facility or nursing home? What about the huge numbers of falls associated with pets and pet paraphernalia? Some 86,000 falls and injuries are associated with pets and their accoutrement in the U.S. each year. They’re cute, but often underfoot, yeah? Just last week, my Grandma-in-Law, Joy, who suffers from vertigo, bent down to pick up an errant kibble of dog food, lost her balance, fell into her bathtub and broke her hip. What a fluke, right? She’s kind of an ideal candidate for pet ownership – 82 years old, autonomous (until her fall), and moderately isolated. But, her sweet little Chihuahua, Lacey, has led her to need relocating and to the loss of her autonomy. I know this, because I get the distinct honor of driving her cherry-red Honda Accord, most of her possessions, and the canine in question down to my mother-in-law’s home in Phoenix, AZ. A lot of drama for a kibble. It is imperative both as family members and caregivers that we help our elders find the right outlet for socialization, care, and activity. Is pet ownership right for a particular person’s particular situation? As with most things, blanket statements about pet ownership being “all good” or “all bad” are over-simplified. 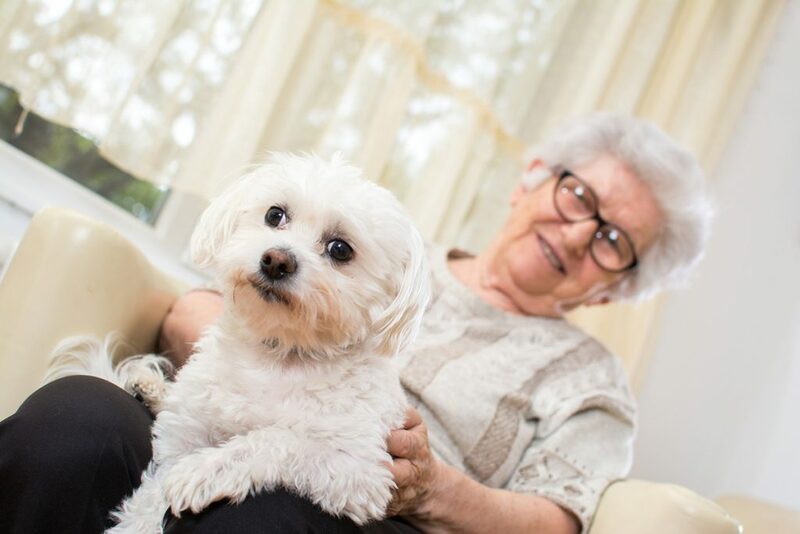 Maybe volunteering at a pet shelter, or taking advantage of pet visitation services at retirement homes, assisted living facilities, and nursing homes is a better answer for your loved one. Or (as I feel may become a recurring theme here at the PSC Blog), maybe, just maybe, elderly people need people much more than they need a Pomeranian.